Americans In China Feel Pinch Of Shifting Economies In recent years, China's status — like its economy — has continued to rise as the economies in America and Europe have struggled. That shift isn't just reflected in economic numbers, and some American business people in China say they don't feel as respected or as valued as before. China has welcomed U.S. business expertise for many years as its economy has advanced rapidly. 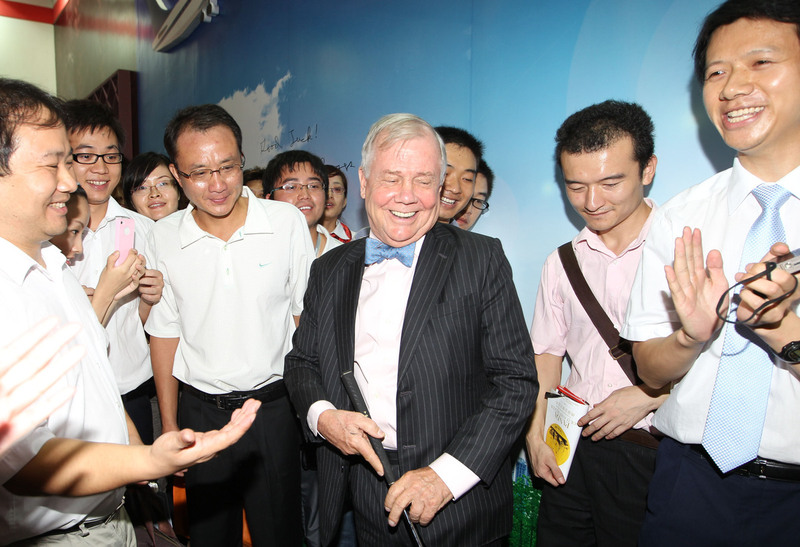 Jim Rogers, a prominent U.S. investor, is shown here in China at the 2nd Hunan Finance Expo in 2011. However, the Chinese are becoming more confident in their own business skills and more critical of American practices in recent years, according to U.S. business executives working in China. In recent years, China's status — like its economy — has continued to rise as the economies in America and Europe have struggled. That shift isn't just reflected in economic numbers, and some American business people in China say they don't feel as respected or as valued as before. Not long after Michael Fagle arrived in Shanghai in 2005 with DuPont, he went to visit a Chinese customer. Back then, Fagle says, he was treated as a sage from the West. "[You were] rushed to the wonderful hotel, receiving gifts, and then dinners and tea ceremonies," Fagle says. "You talked a little bit of business, but it was mostly the Chinese wanting to understand you and listen to your perspective on China and the world." Flash forward to a meeting last year, when the boss of a Chinese tire company picked Fagle up himself in a Mercedes 500 SL, which costs nearly $360,000 in China. Over a three-hour dinner at a local restaurant, the boss boasted about the strengths of China's state-driven capitalism, Fagle says. "He went on about how the Chinese government and their links to the banks and the business community have allowed the Chinese to rise and float over the global recession," he says. The Chinese business owner also criticized America's more private enterprise-focused model. Given the recent track record of the U.S., Fagle says, defending U.S. capitalism wasn't easy. "The financial crisis of 2008 dropped the respect globally, especially in these emerging markets, of our model," he says. "And to them, their model is better." Fagle, who returned to the U.S. last December, says the feel between his first meetings in China and the one last year was utterly different. He says everything was positioned to say: "You are not in charge. I'm in charge. And, by the way, I don't need your business." Bill Dodson began his career in China as a consultant helping foreign companies set up businesses. He says 10 years ago, they were treated like kings. China welcomed all kinds of foreign firms, and it provided tax breaks and other incentives because it needed the investment and know-how. "I was in the city of Changzhou ... and the government official told me, 'You see this plot of land here? If your client comes here, we will give him the plot next door for free,' " Dodson says. "You would never hear that now unless you were in the deep interior of China." That's because China's needs are changing. Coastal cities are no longer interested in pumping out cheap products that line American big-box stores. They want to climb the value chain. Dodson just wrote a book about the phenomenon, titled China Fast Forward: The Technologies, Green Industries and Innovations Driving the Mainland's Future. "If you're in clean tech, you are good, you are in an encouraged industry," he says. "That means they will break down walls to bring you in. If you're just pretty much a regular Joe trying to make a living because this is where your life is, it's different." Every year, Dodson extends his residence permit for another 12 months in China. This year was different. After living there for nine years, his permit was only renewed for another three months. "They said, 'We have to check out if your company is a real company first and then we'll extend it,' " he says. Dodson relies on the permit to live in China legally with his Chinese wife and their young son. He's not sure why he didn't get an automatic yearlong extension, but he sees it as a sign of the times. "The complexion of things here for us expats is changing," he says. So has the competition from the Chinese. Fifteen years ago, foreigners dominated multinational companies in China. Judy Tang, who teaches at the Antai College of Economics and Management at Shanghai's Jiao Tong University, says now Chinese are much more able and worldly. Many have overseas MBAs, have moved into senior management positions and earn big salaries. "Many Chinese people [have] become capable to take the responsibility," Tang says. "The economy has developed so quickly in the past 15 years; this has made some of the Chinese people quite rich." Tang says foreigners still bring valuable skills to China's economy, but that they aren't needed quite so urgently. Author and consultant Jim McGregor has been in China since 1987. He has watched the lives of many Chinese friends transformed, and he thinks it is great. But he also says that as China has become more powerful, the government has become more aggressive with foreign firms. One example is demanding more access to technology in exchange for access to the China market. McGregor sees overconfidence. "China has a fairly full hand, and they're really overplaying it by just this very hard arm-twisting: 'We're China. Don't mess with us. We have the market; you want in. Do what you're told," McGregor says. "People don't take that well." For all of China's success, McGregor and many Chinese themselves see a tougher road ahead, whether it's dealing with crippling pollution, mass demonstrations or keeping the economy on track. "They have so many problems here, and they have a growth model that is based on yesterday's economy," he says. "Never before has a country had such a big part of its growth based on government investment in infrastructure. They need to change their economic model to keep things going here." "So, watch this space," McGregor says. "China has a lot to get through in the next decade." McGregor plans to be around to see it, because despite changing circumstances for foreigners, China remains one of the most exciting places to work in the world. "There is a buzz here that is just so infectious, and ... the Chinese people are great," he says. "They're optimistic, they're dreamers [and] they're risk-takers." Just the kind of people, McGregor says, who built America.